Over the past 18 months I have had spells of sleepless nights at my disposal. What better way to utilize this time than to ponder on how best to monitor my Skype for Business environments. Although this concept isn’t new (I release my initial attempt at this about a year ago), V2 brings many hours of tweaking and polishing. The end result is a more stable, user friendly application that can be deployed in under 10 minutes. That’s including watching my how to video! There are many different schools of thought around how best to monitor environments. Some folks are drawn to the physical aspects and tend to monitor processing, memory and disk. While this is useful information, its hardly sufficient on its own as an acceptable monitoring solution for Lync\Skype for Business. On the other hand, keeping a close eye on services and event logs can be most useful as well. This can lead to lots of verbose information and, on its own, monitoring services and events don’t quite form a complete solution. My thinking involves generating traffic by means of synthetic transactions. It also involves a proactive approach rather than being reactive. If you cant send an IM from user A to user B then its broken, regardless of it being a physical resource issue, a stopped service, certificate expiration or some other issue we have yet to uncover. The fact that the IM attempt is failing is sufficient to get my attention and subsequent action. If your test user cant make a PSTN call to a number of your choosing then there is a problem. Regardless of the true source of that problem (which will likely require an engineer). 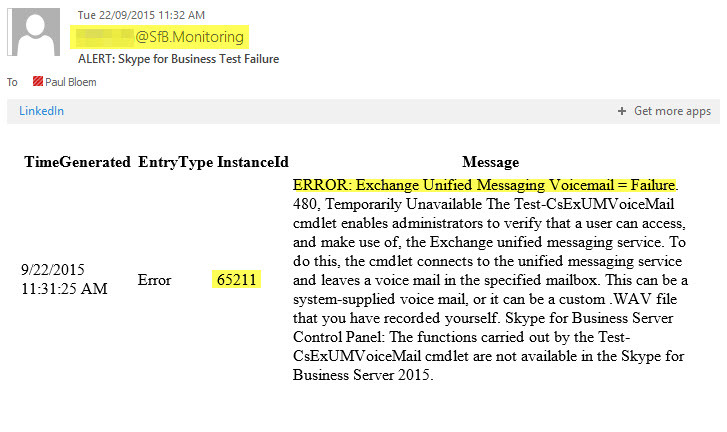 Be it monitoring service issue, SIP\PSTN issue from the provider or an issue with the SBC. It doesn’t really matter..Why? because the issue has alerted me and I am now looking at it. The results of each synthetic transaction are recorded in the Event Log of the PC where the tool is running. Event ID’s also contain a brief description of the test being performed, and in some cases a hint to resolution. The tool also has a Schedule tab that will setup a scheduled task to run the synthetic transactions on a repetition interval of your choice. What’s been added in version 2? This tool is NOT a replacement for the commercially available tools such as Nectar, EventZero or Prognosis. If you are after statistical data and history, triggered actions, dashboards, network performance, Session Border Controller monitoring or even QoS and network monitoring etc. then please do spend the cash and talk to these folks. 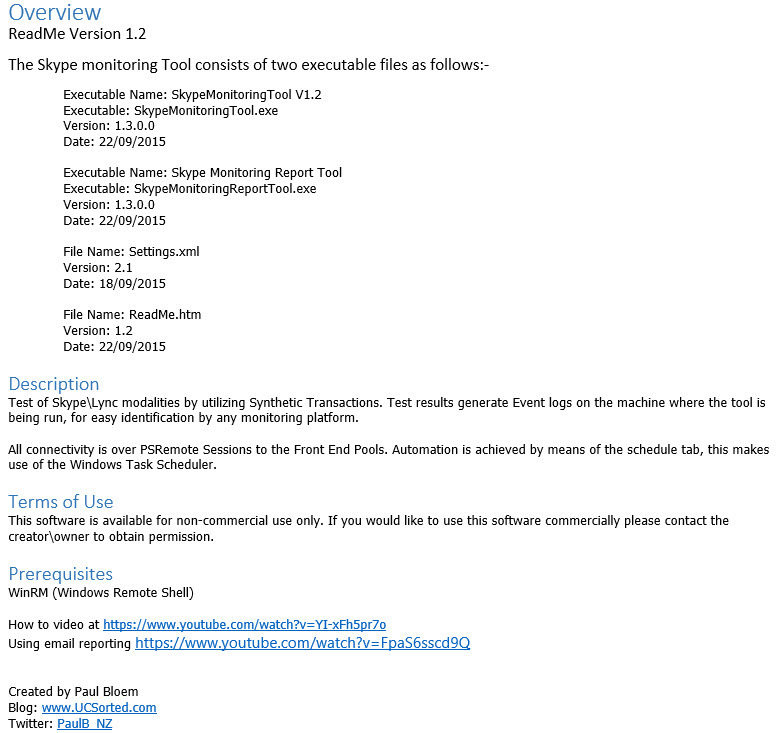 Whats new in Skype for Business Monitoring Tool V1.3? 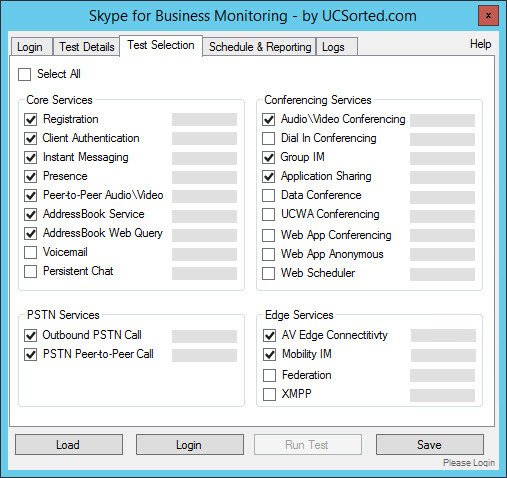 A few months back a new pet project resulted in an application called Skype for Business Monitoring Tool. Simply stated this application is a series of synthetic transactions in a PowerShell wrapper. The tool will run a selection of tests then report the results to the local event log. Shortly after that a reporting module was added. The reporting module will compile an email report covering the previous 24 hour cycle of tests. The report includes a success vs failure rate and colour codes the ratio either green, amber or red to indicate health for each test in question. Since the FROM address isn’t checked for validity, I like to use this address to identify the Customer or Pool that’s reporting the issues. That way I can write an email rule that automatically deals with messages according to my required behaviour (eg escalate or also send to etc.). Of course you need to be sure that your email scrubbing policies allow these through. Please do chime in if you have any suggestions or feedback.